This is going to be a fairly unemotional article. I just typed an entire page of emotional, repressed memory stuff, and I’m sorry, but we just don’t know each other well enough for me to share that kind of stuff with you. Besides, this is supposed to be an article about a book, not about me, right? 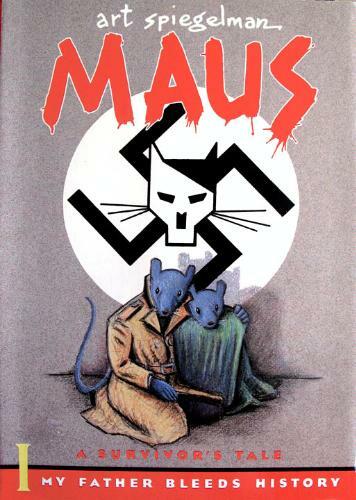 Maus is Art Spiegelman’s biography of his father, Vladek Spiegelman, a Holocaust survivor. It has a casual feel because interspersed with his father’s memories of Poland in the 1940’s is current conversations between Art and his father, and between Art and his stepmother, Mala, also a Holocaust survivor. As his father relates what happened in Poland, Art finds it difficult to reconcile the younger, risk-taking, scheming and braver Vladek with the father he knows, a stingy, cranky, racist old man who snaps at anyone who tries to help him. As Vladek tells his son about growing up in Poland and meeting his wife Anja, Art learns things about his parents he never knew, and I learned things about the Holocaust that the bubbies and zaydies of my youth neglected to tell me.